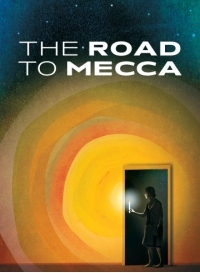 The Road To Mecca is having its Broadway premiere. Set in 1974 (and written in 1984) it is a story based upon a real Afrikaan woman; Miss Helen. Written by Athol Fugard (Master Harold…, etc.) and directed by Gordon Edelstein (The Homecoming) this production stars Rosemary Harris. This three person, two act play centers on Miss Helen’s future. Her young friend Elsa (Carla Gugino) has arrived unexpectedly out of concern for Miss Helen. Elsa, a British South African, has traveled 800 miles (to the middle of nowhere) to connect with her dear friend. The third character, Marius (Jim Dale) does not arrive until just before intermission. Miss Helen’s oldest friend, the reverend Marius is certain he knows what is best for her. It seems an artist, close to 70, living alone in rural South Africa and surrounding her home with large cement sculptures, is a bit troubling to others. There are issues with this play, but none whatsoever with the performances. Rosemary Harris is simply awe inspiring. The character, as written, is not terribly eccentric or unusual, and Ms. Harris does not add any forced mannerisms to compensate. She is such an honest actor, we don’t hesitate for a moment to believe that Miss Helen is a quiet, unimposing woman who has to create. (It is interesting to consider if the real Miss Helen was as devoid of manner, or if this is the playwright’s daring interpretation. Artists, more often than not, are portrayed as borderline mad.) While I was mildly self-conscious of my admiration for Ms. Harris’ stamina and memorization skills, I’d like to think my ageism was reinforced by the play itself. Ms. Harris (in her 80s) is playing a woman nearing 70 whose faculties are beginning to slightly diminish. Carla Gugino (Desire Under The Elms) is absolutely lovely. Elsa is a bit of a rebel in her politics and manages to create a bit of a stir in her upscale world. Her compassion and awareness for the world around her is genuine and she struggles to muster the same compassion for herself. She has driven all day to the Karoo village, after receiving a concerning letter from Miss Helen. It is a believable motivation as Miss Helen lives without electricity let alone a telephone. The first act is too long and too repetitive. Mr. Fugard seems to struggle with assigning worth to words. They are not all equal. There are questions and motivations left unanswered yet metaphors exhausted. The second act is a marvelous change. The arrival of (the wonderful) Jim Dale provides the tension needed. What ensues are wonderful scenes between Marius and Miss Helen, Miss Helen and Elsa and some sly and lovely scenes with all three characters. The set (Michael Yeargan) and lighting (Peter Kaczorowski) are technically excellent, but might need tone tweaking. Much is made of Miss Helen’s issues with light and darkness and with her artistic prowess. Yet, the set (her home) is devoid of much artistry. There’s a bit of sparkly paint, and some mirrors, and maybe that’s how the real Miss Helen lived, but I’m not sure it works dramatically. Much of the play is performed in very dim light as the action takes place during one long night. The lighting, part of the metaphor parade, is distracting. Each time a candle is lit or extinguished, a spotlight gets its wings. The actors are not saddled with microphones (hallelujah) but in the sixth row, I sometimes had to strain to hear Ms. Harris. Audience members further back and not adept at listening, may have difficulty. If one can ignore the awkward technical bits, and endure the first act, see this play. The performances are truly wonderful. I saw this preview for the chance to see Rosemary Harris on stage. I would do it again. The final line of the play, spoken by Elsa, packs an emotional wallop not to be missed. A predictable ending? Perhaps. But it works.